As Africa Embraces Palm Oil, Can It Save Its Forests? Oil palm evolved in Western Africa, but it took root in Southeast Asia, where it’s driving a $60 billion-per-year industry but leading to the destruction of forests across the country. Now West African countries like Ghana are scaling up their production, and Samuel Avaala says they can do so while reviving, rather than destroying, their forests. 20 November 2018 | Samuel Avaala shakes his head as he dips his fork into a bowl of red-red, a traditional Ghanaian stew that gets its color – and name – in part from red palm oil. Oil palm is the tree that gives us palm oil, and the people of Western and Central Africa have been cultivating it for millennia – harvesting and processing the fruit for vitamin-rich oil, used in food and soap, tapping the trunks for palm wine that is distilled into medicinal alcohol, and using the biomass for green power generation. Over the past half-century, the rest of the world has discovered palm oil, too, and today it’s a $60 billion-per-year market that provides material for everything from fuels to food to face paint. But that money isn’t flowing into Western and Central Africa. Instead, thanks to a fluke of history, it’s flowing into Indonesia and Malaysia, which produce more than 80 percent of the world’s palm oil, while the dominant cash crop in palm oil’s birthplace, is cacao – a tree that evolved thousands of miles away, in the Amazon forest, where the Incas used it to make cocoa. It’s all part of an inadvertent crop swap that began when a Ghanaian agronomist named Tetteh Quarshie brought cacao beans home with him in the 19th Century, just as Dutch and British traders were bringing African palm trees to South East Asia and migrants from Spain, Portugal, and Japan were bringing Ethiopian coffee and Asian soy to the Amazon. Today, 66 percent of the world’s cocoa comes from Ghana and Côte d’Ivoire, while Southeast Asia dominates in palm oil, and the Amazon region produces massive amounts of soy and beef. These lucrative crops have been a double-edged sword, bringing economic wealth to some, economic devastation to others, and environmental degradation to all. Indonesia, for example, lost more than 10 million hectares of forest in just the past 30 years as oil palm plantations spread, becoming the world’s fifth-largest (and sometimes third-largest) emitter of greenhouse gasses, and Côte d’Ivoire has lost 80 percent of its forest in roughly the same period to cacao. Now Indonesian and Malaysian palm oil companies are expanding into Africa, and many environmentalists are worried that could accelerate deforestation if natural vegetation is cleared to plant oil palm. Avaala, however, says it doesn’t have to be that way. 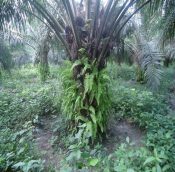 As General Manager of Benso Oil Palm Plantations (BOPP), one of Ghana’s oldest and largest palm oil producers, Avaala aims to help his company grow by spreading ecological and social best practices to small, independent farmers, which he says will help them expand production without deforesting. An ardent proponent of certification programs like the Roundtable on Sustainable Palm Oil (RSPO) as the “floor rather than the ceiling”, Avaala is also part of a growing number of business leaders calling for something anathema to many of his peers: namely, more and better environmental regulation at the landscape and jurisdictional level to create a level field for companies that play fair. Avaala joined BOPP after earning a degree in mechanical engineering in 1991, when the then 15-year-old palm-oil producer was majority-owned by Dutch food giant Unilever – a company that had already established itself as a leader in the burgeoning sustainability movement. Avaala began working in the mill, where oil palm fruit is crushed into palm oil and residue. Then he segued to the plantations, where it’s grown. Finally, he moved to the refinery, where the oil is refined for edible and non-edible uses, before migrating to the executive suite. In 2004, Unilever became a founding member of the RSPO, which was then a fledgling effort to introduce sustainability criteria that a critical mass of environmental NGOs and industrial producers could agree on. After six years of wrangling, the standard became operational in 2010, and Avaala was put in charge of certifying the BOPP plantations. At the same time, he learned that BOPP was being sold to Singapore-based agribusiness giant Wilmar International – a company with a tarnished environmental reputation, but one that had recently joined RSPO and pledged to purge deforestation from its palm oil supply chain. Avaala admits he was skeptical, but he says the new owners quickly demonstrated their commitment to sustainability. The new owners flew him to their certified plantations in Saba, Malaysia, where he says he was impressed with the way they engaged independent smallholders. BOPP was already becoming more and more dependent on independent smallholders, which presented its own challenge: their yields were usually lower than those on the company’s own operations, which often led farmers to chop forest when looking to generate more income. “If you can dramatically increase yields with only a marginal increase in costs, then you can get more production from the same piece of land,” he says. Smallholders and “intensification” have become hot topics among companies looking to reduce the impact that their soy production has on forests. Indeed, of 284 palm-oil commitments tracked by the Forest Trends Supply Change initiative, 77 of them have pledged to provide some form of support to smallholders, but only 25 of them explicitly say they will increase yields per hectare without increasing agricultural expansion into forests. In 2014, BOPP joined an initiative led by the Solidaridad Network called the Sustainable West Africa Palm Oil Program (SWAP) and began testing intensification practices at nine of its sites. “It’s amazing what you can do with some very simple procedures,” he says, describing a rotation implemented under SWAP where trees are pruned, trimmed, and harvested of ripe fruit every seven days. BOPP currently works with 438 smallholders, who provide 25 percent of its supply, and 25 percent of them are women. Avaala says the challenge now is to spread these practices across the landscape. “We’ve already helped the smallholders who work directly with us, but it makes sense for us and other big companies to work with local chiefs and assemblies and other smallholders to spread best practices across the landscape, because that will come back to us in the end,” he says. 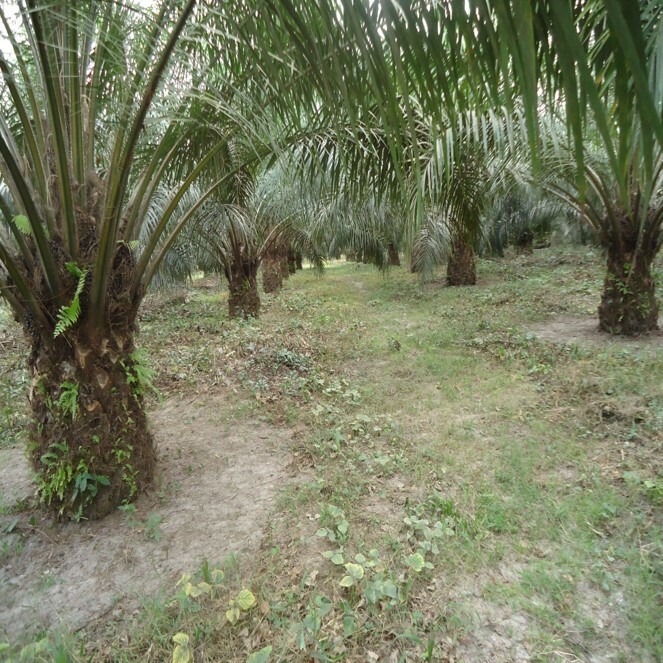 A typical, shaggy oil palm wastes its energy on non-oil growth, but…. Towards that end, Avaala joined the Ghanaian steering committee of the Africa Palm Oil Initiative (APOI), which is an international effort launched in 2014 by the Tropical Forest Alliance 2020 (TFA 2020) after several of its members identified palm oil as a threat to African forests. Administered by the nonprofit environmental consultancy Proforest, APOI aims to promote common principles of sustainability among governments and palm oil producers across the region, drawing on input from national steering committees. Through APOI, Ghana became one of seven countries whose government signed the high-profile Marrakesh Declaration for the Sustainable Development of the Oil Palm Sector in Africa, which was signed at the 2016 climate talks in Marrakesh, Morocco. Countries sign the Marrakesh Declaration in part to attract global buyers interested in sourcing deforestation-free palm oil, and much of 2017 was devoted to forging standardized procedures – despite sharp differences in language, landscape, and legal tradition.